Home > WESTERN BELTS > 2501 Texas Seal Scallop Braided Western Belt - Available up to size 60"
1 3/8" = 35 mm Wide tapers to 1" Wide by the buckle and the tip end. Genuine leather hand laced scalloped edge leather braided belt strap. 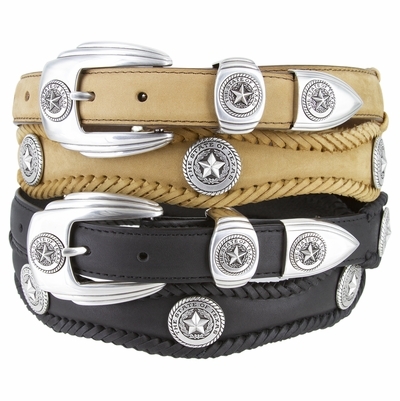 Silver hand polished sterling silver plated 3 piece Texas Seal buckle set adorned with Texas Seal conchos made from hand engraved masters along the belt.